I ended up using two different solutions for exhaust fans with LED lighting. 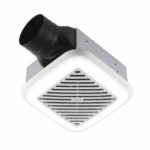 For those not looking to retrofit or keep costs down the classic Broan fan is likely already installed in most bathrooms or easily installed. The Cree LED light bulb has plenty of light output and a high CRI that is not affected by the white opaque lens on the fan. The Broan 791LEDM fan moves 110 CFM at 1.5 Sones. If you are replacing an existing exhaust fan, this is likely smaller, meaning you’ll have to do some sheetrock work to fill in the gaps this will leave around the edges. In my testing it is much quieter than the builder grade fans and the light output has no issues covering a half-bath or smaller full bathroom.